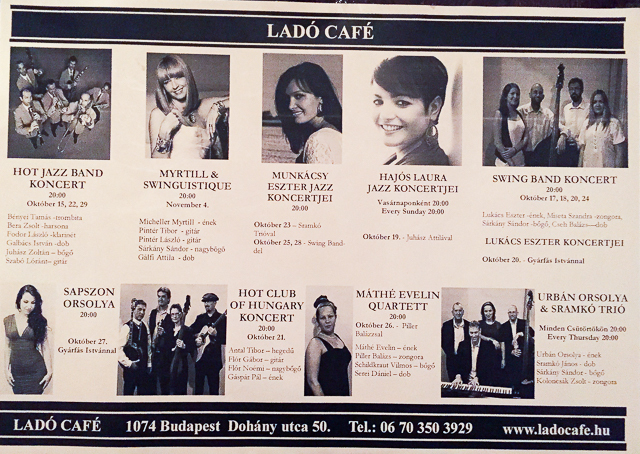 Lado Cafe, Budapest, Hungary | Should We Go There? So on to the post. It’s our first night in Budapest and we wanted to try some of the local flare. The front desk folks almost in unison recommended we try the Lado Cafe, and also recommended we make a reservation. They called the restaurant for us but were told they were booked for the evening. OK, so now what? As we’re trying to figure out plan B, the restaurant called the hotel back and said they had a cancellation and could fit us in. Problem solved. The restaurant was only about five blocks from the hotel so we set out on foot. The restaurant is in an older part of town which seemed to be a popular area for younger adults, with many bars and restaurants. We found the restaurant quite easily as it was probably the best lit establishment on the street. 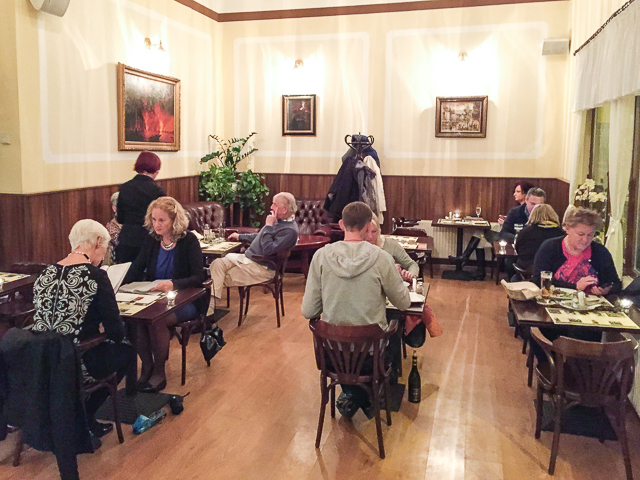 The restaurant is family owned and operated specializing in traditional Hungarian cuisine. Upon entering, it looked like a 60’s style supper club with tables leading up to a stage for the nightly live entertainment. The staff was very friendly and all spoke English. We ordered Hungarian wine, both red and white. Both were quite nice. The food was very good with nice presentations. As we were waiting for our meals to arrive, the entertainment showed up and began playing American songs from the 50’s and 60’s. Go figure. We all decided to have dessert, which I usually skip because I have an uncontrollable sweet tooth. 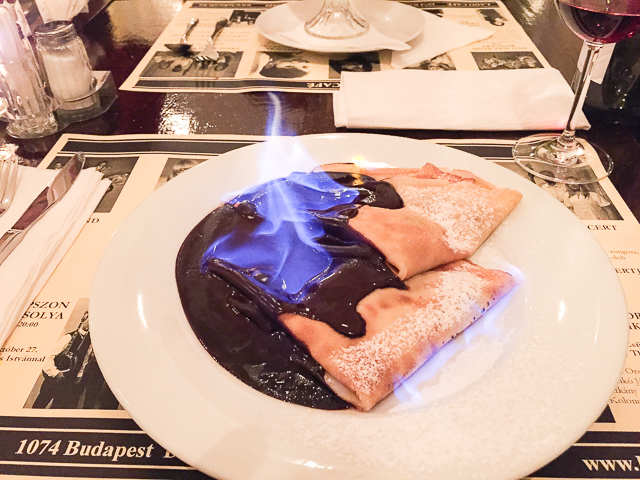 To be honest, I can’t remember the name of my dessert, but it was a crepes with pecan puree type thing, covered in chocolate, doused in rum and set on fire. I thought I was going to need a fire extinguisher to put it out, but blowing on it worked just fine. It was excellent! So good in fact, I had it the next night at a different restaurant… but that’s another post. 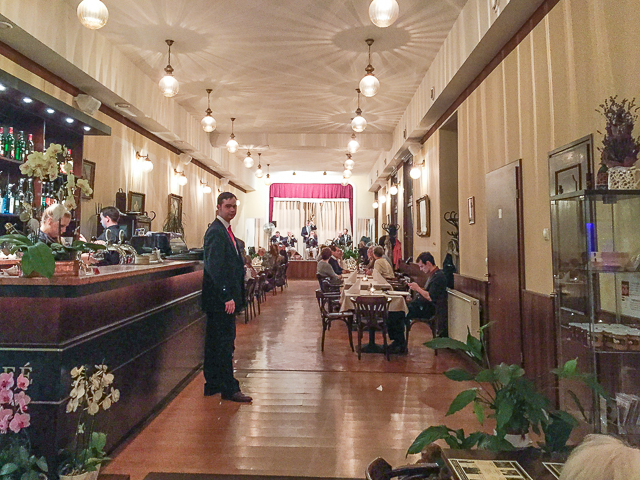 If you ever get to Budapest, you really need to try this restaurant, but don’t forget to make a reservation. It’s not a fancy place as you can see in the photos, but it’s comfortable and relaxing with good food and service. If you’ve seen my other posts, you should be familiar with my term “Prague prices”. 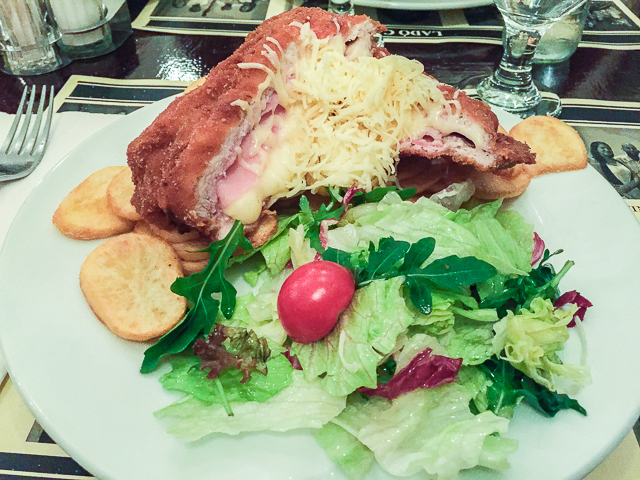 Budapest is not quite Prague prices, but it’s close, and so is this restaurant. Translation: very reasonable prices. The live entertainment starts at 8:00PM and changes regularly. The entertainment schedule is actually on the place mat, so you may want to read it before you eat. Just sayin’. Here is the contact information for the restaurant.